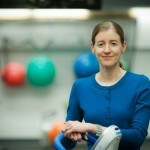 Dr. Campbell, BSc.PT, PhD, is a physical therapist and research scientist who is leading the effort to understand the role of exercise in chronic diseases, particularly cancer. Her group focuses on principles of exercise physiology, clinical trials methodology and epidemiology to examine the beneficial effects of exercise and inform clinical practice. She represented the Cancer Interest Group of the American College of Sports Medicine at the roundtable to develop the first published exercise guidelines for cancer survivors and helped to develop the Cancer Exercise Specialist certification from the American College of Sports Medicine. Dr. Campbell is a Canadian Breast Cancer Foundation funded researcher for one of the first intervention studies on exercise and “chemo brain”.